It’s been more than 60 years since Ghana achieved independence. But the economy shaped by colonialism faces a debt crisis and speculators continue to extract large profits from the country. Ghana is in a debt crisis. Despite having had significant amounts of debt cancelled a decade ago, the country is losing around 30% of government revenue in external debt payments each year. Such huge payments are only possible because Ghana has been able to take on more loans from institutions such as the International Monetary Fund (IMF), which are used to pay the interest on debts to previous lenders, whilst the overall size of the debt increases. The underlying causes of the debt crisis are the continued dependence on commodity exports, as well as borrowing and lending not being responsible enough, meaning that new debts do not generate sufficient revenue to enable them to be repaid. Ghana’s dependence on commodities dates back to colonialism. 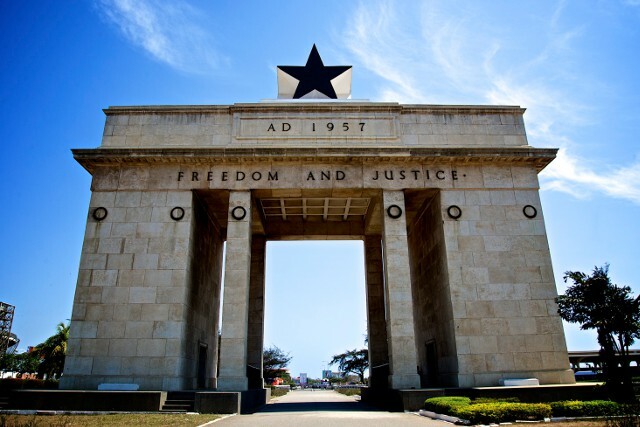 The borders of the country now known as Ghana were established by the British colonists in the late-19th century. The Europeans had first started coming to the ‘Gold Coast’ in the late-15th century to open up alternative trade routes to the Sahara in order to access the region’s gold. The Portuguese, Dutch, British, Germans, Swedes and Danes all built or occupied castles and forts which were used as prisons for the slave trade. The ending of the slave trade coincided with the industrial revolution, when European powers once again became more interested in Africa’s physical commodities – raw materials such as fossil fuels, metals and cash crops – rather than in forcibly shipping its people across the Atlantic. With the ‘scramble for Africa’ in the 19th century, the British extended their influence further inland, seeking direct control of gold and other resources. Whilst Ghana was the first colonised country to achieve independence in 1957, over 60 years on, the country’s economy remains dependent on the export of just three primary commodities – gold, cocoa and now oil, which together make up over 80% of Ghana’s exports. This dependence on commodities was the central factor underlying a debt crisis which was common to much of the global South in the 1980s and 1990s. Global commodity prices fell at the start of the 1980s, rapidly increasing the size of foreign debt payments which could only be paid out of foreign earnings such as exports. As commodity producers across the world expanded production in order to pay debts, on the advice of the IMF and World Bank, commodity prices stayed low for over 20 years. From the mid-1990s the global Jubilee movement called for debt cancellation, which led to the creation and enhancement of two debt relief schemes run by the IMF and World Bank, the Heavily Indebted Poor Countries initiative and Multilateral Debt Relief Initiative. As a result of this debt cancellation, Ghana’s government external debt fell from $6.6 billion in 2003 to $2.3 billion in 2006. Significant improvements in education and healthcare followed, due to money being saved and invested, alongside good government policies, enhancing basic service provision. The proportion of children completing primary school was static at around 60-70% from 1980 to 2006, since when it has increased to almost 100%. The proportion of births attended by a skilled health professional only increased from 44% to 47% between 1998 and 2006, but in the following eight years it increased to 74%. However, Ghana’s dependence on commodities continued, and as prices rose, this created more willingness for lenders to give loans off the back of a growing economy. Between 2006 and 2013 Ghana’s GDP per person grew by 44%. However, over the same period the number of people living below the national poverty line only fell by 10%, a slower rate than in the previous seven years when growth had been far lower. The reason was that much of the proceeds of growth went to those with the highest incomes. For every GH₵1 increase in income for the poorest 10%, the incomes of the richest 10% increased by more than GH₵9. This rapid economic growth led to an increased willingness and desire of various institutions to lend to Ghana, with a corresponding willingness to borrow. Loans increased steadily from 2008 to 2011. In total, between 2007 and 2015 there were $18.2 billion of external loans and $9 billion of debt payments, leaving $9.5 billion of the additional borrowing to be spent within Ghana. In early 2013 the price of gold fell significantly, as did the price of oil from the start of 2014. Between 2013 and 2016 the value of the cedi against the dollar fell by 50%. This caused the dollar-denominated size of Ghana’s economy to fall from $47.8 billion in 2013 to $36 billion in 2015. Because external debts are owed in dollars or other foreign currencies, this has in turn increased the relative size of the debt and debt payments. External debt has grown from $14.7 billion in 2013 to $21.1 billion in 2016 (an increase of 44%), yet because of the depreciation external debt has gone up from 30% of GDP in 2013 to an expected 56% in 2016 (an increase of 87%). One response to these economic shocks has been for the government to borrow more money. The interest rates on the new debts are high, including 10.75% on $1 billion borrow in 2015. For this loan, the World Bank broke its own rules by guaranteeing $400 million of payments if the Ghanaian government fails to make them. The World Bank is not meant to give such guarantees for governments assessed as at high risk of debt distress, which Ghana had been for the previous seven months. The high interest rate and guarantee mean that if the Ghanaian government were to pay the interest every year until 2024, then default on all other payments from 2025, including the principal, the bond speculators would still have made $90 million more than if they had lent to the US government. This means that the speculators lent to Ghana believing that there was a high chance they would not be fully repaid. However, for the moment those speculators are being paid, in part because since April 2015 the IMF has been lending more money which is being used to meet debt payments, effectively bailing out previous lenders. In return, the Ghanaian government has to cut government spending and increase taxes. Under current plans, government spending per person (adjusted to account for inflation) will fall by 20% between 2012 and 2017. Debt is already placing a significant burden on Ghana’s economy and society, and the country is at risk of falling back into an extended debt trap, with an economic stagnation and possible increases in poverty rates and failure to implement the Sustainable Development Goals. Today’s crisis has resulted from a multitude of factors: failure to diversify away from commodities, the government and lenders failing to ensure loans were used productively enough, falling global commodity prices, particularly gold and oil, and the opportunism of speculators lending at high interest rates seeking large profits.